It's been said that money makes the world go 'round. Well, the truth is, relationships make the world go 'round, not money. Think about it: Your income comes from people. Fulfillment comes from interaction and activity with people. Opportunity comes your way through people. Everything of value in your life comes through people! Which is why there's no more important, more beneficial skill in the world to develop than people skills. But have you ever wondered why it's so easy to connect with certain people, yet so difficult with others? The reason is, people are not all the same. You can't communicate with everyone exactly the same way and expect to get the same response. People's responses to identical situations can be as diverse as the people themselves. If you want your world to be filled with opportunity and abundance — both financial and emotional — then you need to understand the differences in people so you can make the most of every unique encounter. Everyone knows the Golden Rule: "Do unto others as you would have done unto you." But this habit can turn off those who have different needs, wants, and hopes than you do. "Do unto others as THEY would like done unto THEM!" Each of us telegraphs our personality style in countless small ways, such as the way we shake hands, how our offices look, and whether we're crisp or chatty on the phone. The trick is learning to spot these signals, identify the other person's style, and adjust your behavior to lessen conflict and move you toward your desired result. 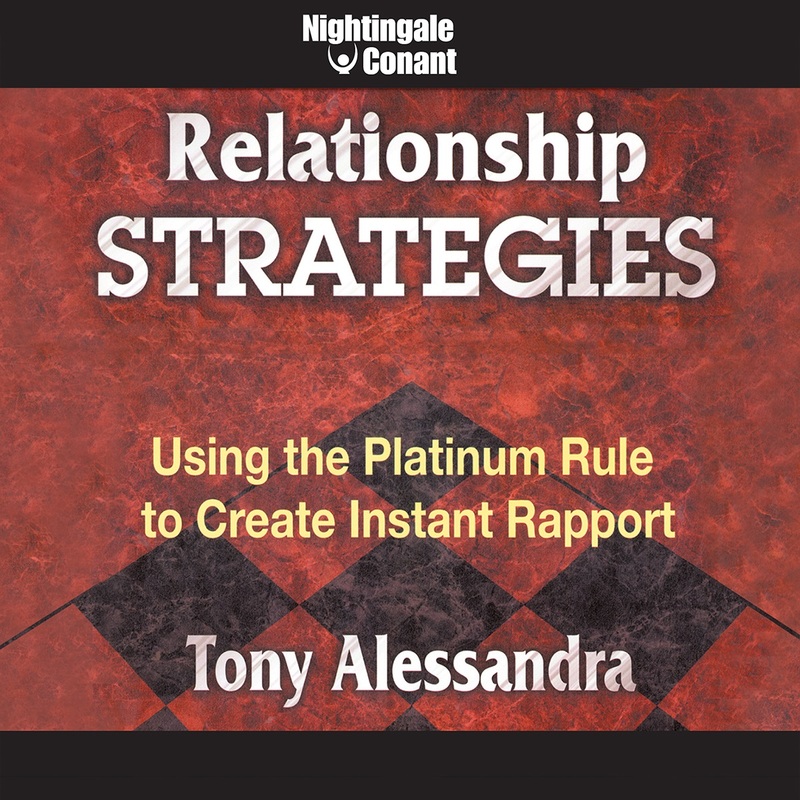 In Tony Alessandra's audio program Relationship Strategies: Using the Platinum Rule to Create Instant Rapport, he shows you how to do just that. Understand the four basic behavior types — Director, Relator, Socializer, and Thinker — and how to deal effectively with each. Easily determine the personality style of everyone you meet, using the DISC personality assessment. Behave in a way that will improve your compatibility with everyone. Accelerate the process of getting to genuinely know people. Understand your own personality and why you act the way you do. Improve your productivity and career prospects. Pick up emotional cues in verbal, vocal, and visual behaviors. I'd like to invite you to experience the remarkable power of the Platinum Rule and the rest of Tony Alessandra's Relationship Strategies for yourself. Once you master the Platinum Rule, you'll be able to build bridges to anyone in any situation, such as asking for a raise, closing a sale, forming an intimate relationship, planning a big project, or building morale. Not only can you improve your career prospects, productivity, and customer relations with this extraordinary program, but you'll have fewer conflicts with the people with whom you interact every day. Bottom line, you'll have gained a desirable advantage, one that will make almost everyone you know want to work with you, help you, and, heck, just hang out with you! And that advantage can take you further than you can imagine. Find out for yourself. Order Relationship Strategies right now! I want to experience the extraordinary power of the Platinum Rule to enrich and strengthen my relationships forever! Relationship Strategies for the special price below. I can select one of two ways of ordering.